A groundbreaking public health study (link is external) discovered that childhood trauma leads to the onset of many of the health and social challenges faced by our communities. 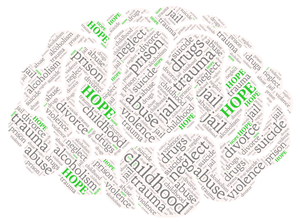 Adverse childhood experiences (ACEs) — abuse, neglect, a mentally ill caregiver, drug- or alcohol-addicted family member, incarcerated household member, domestic violence, loss of parent/divorce — harm children's developing brains so profoundly that the effects continue to impact their lives as they become teens and adults. The more ACEs a person has, the higher their ACE Score, and the greater their risk for long-term consequences. For example, people with an ACE score of four are 2 times as likely to be smokers and 7 times more likely to be alcoholic, have a 400% increased risk of heart disease, and a 1200% increased risk of suicide. In fact, the study showed that ACEs are the most basic and long-lasting cause of health risk behaviors, mental illness, social malfunction, disease, disability, healthcare costs, and early death. But there is hope for healing! Many of the agencies in our communities are working with children, teens, and adults whose challenges of homelessness, abuse, poverty, or mental illness represent the “downstream” wreckage of ACEs. Attend this training to understand ACEs and learn a new way to serve our library patrons... this new way is called “Trauma Informed Care”. Presenter: Mandi Dornfeld, ACE Interface Trainer, Winnebago County UW-Extension. Lunch: enjoy the build-your-own burrito bowl buffet catered by Qdoba for $8, or bring your own. • SLP 2018 "Libraries Rock!" Activities and Program Ideas: Early Literacy, Preschool, and Elementary Grades. Presenter: Cassie Payne, Menasha Public Library. • Teen Services “Share Out.” Share about a program that worked, or didn’t. Come prepared to participate – no lurkers! • SLP 2018 "Libraries Rock!" Activities and Program Ideas: Tweens & Teens. Presenter: Cassie Payne, Menasha Public Library. • Sharing Time. Come to discuss your challenges and successes, and get advice from your peers on troublesome issues. • The Uncomfortable Truth of Children’s Books. If you struggle with thinking diverse books are “hard sells” or not for my community because “we don’t have that ethnic group represented”, this session will give you a fresh outlook, practical ideas for bringing the world to your families through books, and an understanding why we need more diverse books in our patron’s hands, especially now. Presenter: Sue Abrahamson, Waupaca Area Public Library. • SLP 2018 Sharing Time. Bring samples of your ideas for "Libraries Rock!" themed activities to show and tell. Moderator: Marie Boleman, Oshkosh Public Library. • samples of your SLP 2017 log sheets and brochures, so we can have a tableful for everyone to browse through during the day. This workshop is co-sponsored by the Winnefox Library System and the Outagamie Waupaca Library System.